A milestone for Australia post, it's bicentenary has brought new issues from our postal giant. 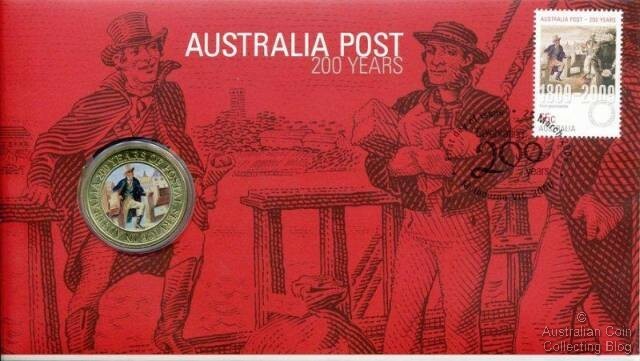 Celebrating 200 years of postal services in Australia a stamp series has been issued. The stamps highlight the contribution the postal service has made to the lives of Australians since Isaac Nichols became the first postmaster of New South Wales in 1809. Along with the various stamps and first day covers Australia Post has teamed up with The Perth Mint to produce a PNC to celebrate the series. This postal numismatic cover features a Perth Mint one dollar coin and a 55c stamp on an illustrated cover. The dollar is a non-circulating coin but it is officially legal tender. It has a coloured reverse design representative of Isaac Nichols. The commemorative stamp is postmarked with the anniversary date 25 March 2009. This PNC has an issue price of $14.95 with no stated mintage numbers. There has been quite a decline in the pnc market lately after the great pnc excitement of 2008. Personally I think there's no real investment in obtaining this pnc and isn't likely to rise in price any time soon.